As one of India’s leading Carnatic vocalist, Sudha Ragunathan has carved a niche for herself where the soul of her music effortlessly intertwines with the dynamism of her presentation. Sudha is a disciple of the legendary Carnatic vocalist - Padma Bhushan awardee Dr. ML Vasanthakumari. She also has the distinction of being the only Carnatic musician, second to Bharat Ratna Dr. MS Subbulakshmi, to have sung at the United Nations, New York. Her music echoed in the hall of the United Nations on 2nd October, 2016, the International Day of Non-Violence, 50 years after 1966, when Dr. MS Subbulakshmi performed. In addition to receiving the Padma Shri in 2004 and the Padma Bhushan in 2015 from the Government of India, Sudha was also conferred the Sangita Kalanidhi in 2013, which is the highest recognition for performing artistes from the prestigious Madras Music Academy. Apart from these honours, she is also the recipient of over a 1oo awards from various organizations across the world. Sudha Ragunathan has travelled extensively and performed at several prestigious venues world over as a solo artist, also collaborating for world music festivals and for lecture-demonstrations (teaching workshops) to demystify and disseminate the language of Carnatic music to a diverse audience. Apart from all of her concerts and performances, Sudha also is a Guru (teacher) and her students are from both within and outside of India. She launched her own school ‘Sudhaarnava - Academy of Musical Excellence’ in April, 2017, with the objective of training senior-level students and nurturing talent to produce quality performers. Samudhaaya Foundation was launched in 1999 as an outcome of Sudha’s desire to give back to society through her music. She is the Founder and Managing Trustee of the Foundation and believes that her music can have a great impact on communities, and often reaches out to serve the people through her own concerts or via fund-raising. Even prior to 1999 Sudha was involved in social activities and sang for music concerts to raise funds for charities outside her organization. But she was singing for others and for the cause they chose. She then felt the need to have an individuality and the independence to have her choice of causes and work for them at her discretion. This thought was what propelled her to launch her own foundation. For Sudha it is Mother Theresa who is her role model. She believes that there is no match for her compassion, sacrifice and selflessness. Humanitarian service brings peace to the heart said Mother Teresa. This thought is fully reflected in Sudha’s music that is soulful and her deeds are all of high-octane passion and dedication. It was a time when there was so much news about the Kargil war – about families who had lost their sons, some newlyweds having lost their spouses and many who lost their fathers. Sudha was deeply moved and wanted to do something for the families that had lost their loved ones. She wanted to somewhere get connected and offer her support to the families and she wanted to do it through her music. She immediately contacted a few organizations who were mobilizing funds to support these families and participated in their fund-raising efforts. This was Samudhaaya Foundation’s first baby step towards a mighty vision. Today, Samudhaaya Foundation has identified and supported varied causes. Primarily, the focus is on children from low income backgrounds – for paediatric cancer care, paediatric heart surgeries, for children with cognitive deficit, for children who have experienced some form of abuse and for children with hearing and visual impairments. Apart from these, there are other areas like palliative care, infrastructure support, organ donation and water bodies restoration that have benefitted by Samudhaaya’s helping hand. Sudha makes it a point to personally visit corporates to raise funds. For every cause, she makes a checklist and personally calls to fix appointments and make presentations to represent the causes. She has been able to establish her credibility and build in conviction and faith in her donors that their donation reaches the right destination. When she identifies a cause that she wishes to support, she begins her mission of raising funds. The cheque is then presented to the beneficiaries in the presence of dignitaries and eminent members of the society at a well-attended event. Sudha’s Guru Dr. ML Vasanthakumari was a generous and giving person. During her 20th death anniversary, it struck upon Sudha that as she gave so much of herself and her music and continues to live in so many hearts today, that on this day why not she spread the word of organ donation – the gift of life. There was a small event to promote awareness and Sudha took up the pledge and along with her so did her family and friends. The very first day saw over 20 donors. This website has a registry for enrolment where over 90 people have registered so far. Sudha has taken Carnatic music to the Corporation Schools and old age homes in Chennai, India. 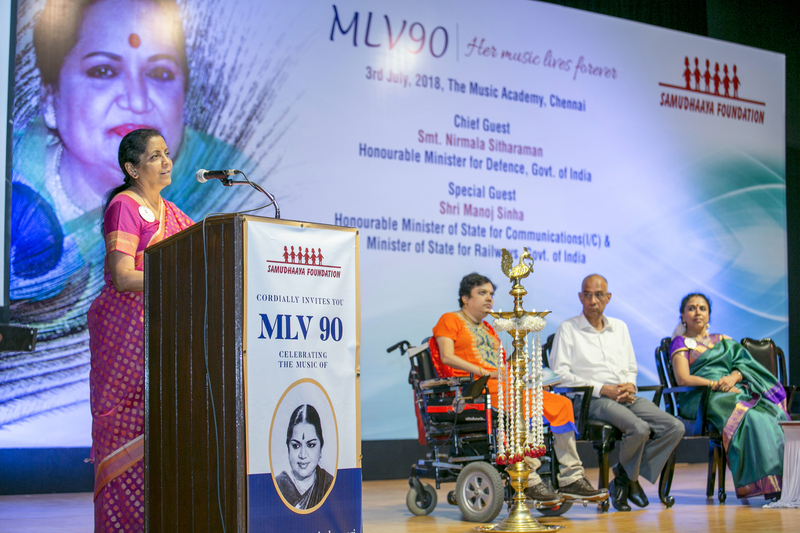 Along with her students and members of the music fraternity, Sudha had lecture demonstrations and performances at select schools in the city of Chennai. Sudha Ragunathan has chosen organizations and institutions of repute as well as those less sung ones doing heroic service to the needy and hence it is an inclusive one to ensure the beneficiaries are drawn from all strata of society. Her commitment to serving the society reflects her compassionate heart, caring mind and unswerving commitment to the betterment of people in every possible way. Inspired by many service minded individuals and organizations Sudha has gone her own way putting compassion first. Samudhaaya Foundation continues its quest in identifying causes and supporting them through Sudha’s music and through the generous hearts that appreciate and enjoy her music. Explore this website to know more about the different causes supported by Samudhaaya Foundation. We hope it moves and inspires you to open up you heart and contribute towards the betterment of society. Indian Overseas Bank, West Mambalam, (Code No. 868) Chennai 600 033.